Swarm Blog: Hey Geography Buffs, Show Off Your Skills Here! The latest Android game, Countries Capitals Quiz, by developer Paridae gives players the opportunity to show off their geography skills or learn new ones. 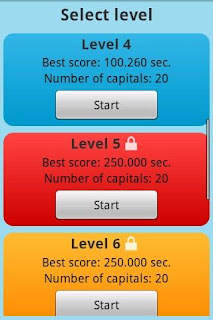 In Country Capitals Quiz, players can enjoy trying to recall 200 different country capitals spread out across 10 different difficulty modes. Players are scored based on how quickly the capitals are successfully identified, and the overall score is generated based on the sum of all times across all levels. The faster you are, the better you'll score, and the higher you'll reach on the global leaderboards (powerd by Swarm). Compete against yourself, your friends, and the world! This game takes a truly worldy approach thanks to Paridae's dedication to supporting a multitude of languages. 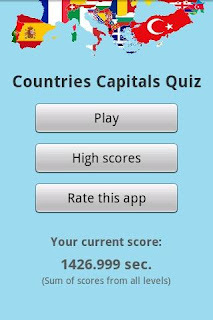 Country Capitals Quiz can be enjoyed by nearly everyone on the planet thanks to its helpful translations in 12 different languages (English, German, Spanish, French, Italian, Japanese, Korean, Dutch, Polish, Portuguese, Russian, and Chinese). The game language is automatically set based on the phone's language setting, so this means that no configuration is required. Seems simple enough, but it was a thoughtful move on Paridae's part. What's more? Countries Capital Quiz for Android is completely free, so you've got nothing to lose and a ton of geography skills to gain. Paridae did a really nice job with this app, and we think you'll enjoy expanding your horizons!